Over the years we've helped clients put their most off the wall ideas onto their walls. Today's entry features a bookstore in New York, where the owner had the inspired idea to create a custom wallpaper pattern to dress the walls of the shop's cafe area. The pattern was created using imagery of open books that the client provided. The bookstore is McNally Jackson Books, located at 52 Prince St., New York, NY 10012. The owner of the shop had a clear vision of what she wanted to accomplish, it was up to us to make the custom wallpaper a reality. We created a standard repeat using her photos which slightly varied in shades, which kept the design more interesting, less static. The open books give the wallpaper a trompe l'oeil effect; it actually looks like real books are splayed open across the walls. When using a custom wallpaper installation in a business, one must always be thinking of the impact of the wallpaper on the viewer. 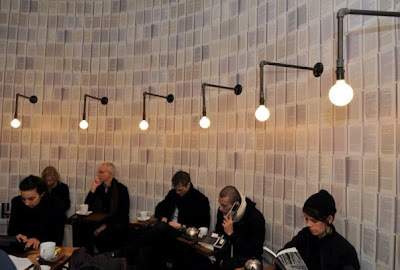 In this case, the custom wallpaper couldn't be more properly suited for the space, and the book theme easily carries the written word out from the bookstore into the cafe. This was one of our favorite projects of '09, we wish McNally Jackson Books continued success!